NIcely Treed second row Lake Lot with view of Lake. Partial fencing, nice pad site, outhouse with 800 Gallon tank. Good mix of open and treed areas, picnic table area at back of lot. 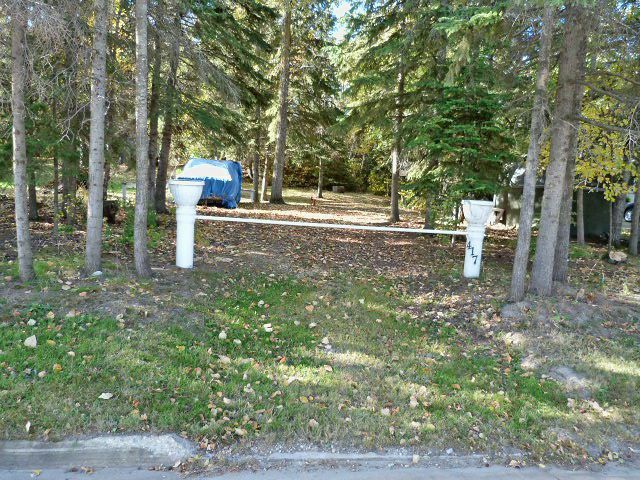 Ideal for someone how has a motor home and would like to have the best of both worlds by have a place to park the motor home and have use of the lot when not using the motor home.Located in Summer Village of Sandy Beach, only a 35 minute drive to Edmonton or St. Albert. Yearly Lease Available. 48 Feet of frontage and 150 feet deep, Front yard is gravelled and has partial feature fence. Middle of lot has parking pad area with open area with some trees. The back of the lot slopes up and is heavily treed. Boat launch Area, Public Beach with outhouses, Community Hall, Store with gas, Walking area, Bridge crossing in middle of lake, many treed drives and viewing benches.